Beside histamine intolerance vegetarianism respectively veganism and sustainability are important topics to me on the blog. Especially concerning teeth I have posted quite a bit on the blog already, e.g. this recipe for DIY toothpaste without sorbitol and without fluoride. And also today I would like to write something about dental care. About every 8 weeks or so I’ll swop my toothbrush for a new one. That means, in only one year, only because of me there will be 6 toothbrushes in the trash bin and subsequently in the world’s oceans and plastic is, as we all know, not biodegradable. Sooner or later it will corrode into ever smaller bits, but these plastic bitsies (not only from toothbrushes, of course) will be introduced to our food chain. Fish and other animals may take in parts of it with their food. They become sick. Such contaminated animals might also end up on our plate one way or the other, besides, this trash also pollutes our (drinking) water, beaches and threatens coral reefs, etc. The reduction of plastic waste is something that concerns us all. Therefore I already stop using feminine hygiene disposables. 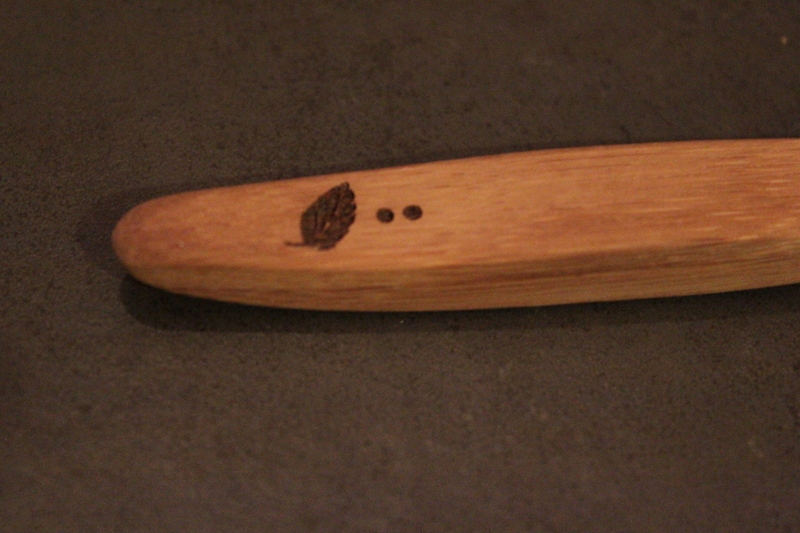 That there are already sustainable toothbrushes made of wood available I only learned quite recently. This is an easy way to reduce a little more plastic waste. 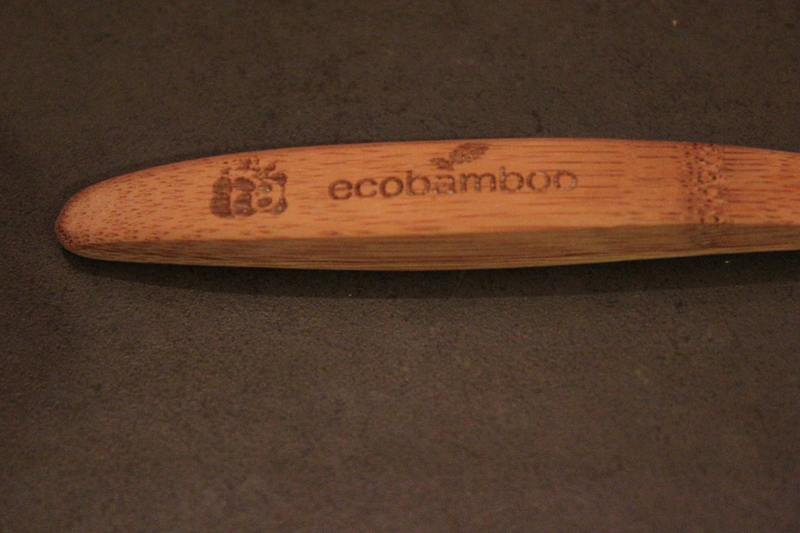 The toothbrush I use now is made of bamboo and needs much less plastics than a regular toothbrush in comparison. 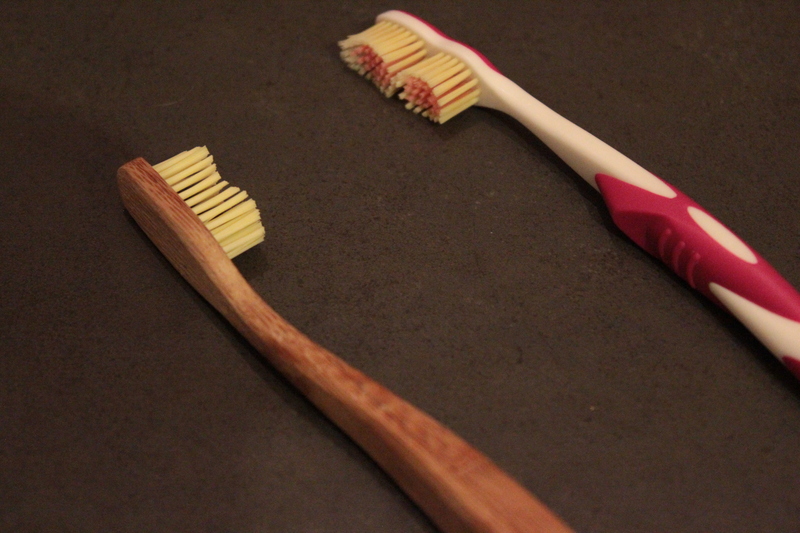 The toothbrush leaves you with a little “wood-like” taste after using or as I say “forest taste”. The cleaning ability is the same. After usage one should store the toothbrush in a dry place (meaning, not in the shower or so) and then this brush has about the same life span as a regular toothbrush. After 6 to 8 weeks it should be replaced by a new one. 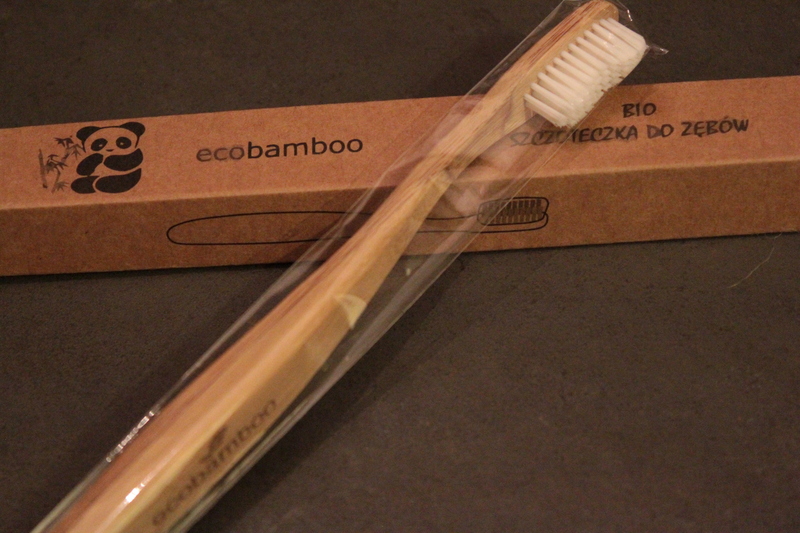 In cooperation with the Austrian shop BioVeganVersand I’m giving away a family set (1 soft, 1 medium for adults and 1 for children) of Ecobamboo toothbrushes on my German speaking blog for Austrian and German readers until Christmas (12/24/2014). I’ve made cosmetics again from scratch. This time it’s body melt with natural SPF. There is more to come, because the box Shaolin is occupying here contained lots of ingredients for making cosmetics. Melt cocoa butter by bain-marie. In summer coconut oil already is liquid at room temperature, because it is so hot. If it is hard with you , you can melt it together with the cocoa butter. Add the other ingredients bit by bit. Mix it all well with a blender. Fill in an old cleaned jam jar or creme jar. Leave in the fridge for about an hour for the creme to harden. Seems like I was somewhere else with my thoughts, because I left the bowl in which I blended the creme in the fridge. So I had to spoon out the creme and fill it into the proper container. This problem of course is just an aesthetic one as in the creme won’t have a smooth surface in the jar. If you react to scents very easily, you can omit the essential oils (vanilla and ylang-ylang). If you prefer another scent, you can of course choose different essential oils fitting your taste. It has a yummy scent to it and it does not leave thick white marks on the skin. No artificial scents, no preservatives, no hormone-like substances (parabens). And? You made it yourself! Why make toothpaste yourself (when suffering from HIT)? Especially people suffering from sorbitol intolerance at the same time have problems with most commercial toothpastes. Another problem besides sorbitol is fluoride. Flouride not only binds aluminium and other heavy metals (we do not want that in the body! ), it is not only a fibrinogen (causes you temperature, also don’t want that), flouride also inhibits the enzyme amylase. And amylase is a histamine blocker (we can use that!). Especially to digest carbohydrates we need amylase, too. Experts classify fluoride as carcinogenic (can cause cancer). Moreover, it can promote diseases like alzheimer’s and diabetes. The common advice many dentists still give, that fluoride helps against caries/tooth-decay is just a myth or a lie. Actually the opposite is true. Other reasons to make toothpaste yourself? Our little cancer patient Shaolin who is with us since last November was of inspiration for this one by the way. She has a kidney tumour and also the pancreas is acting up once in a while. Especially digestive problems are the result. We were able to manage the digestive issues to a great extend. Yet, sometimes she has gum bleeding which stops her from eating. Luckily we’ve also found a solution for this one now: malva tea. Since cats say yuck to sage tea, which basically does the same thing, malva tea is a great alternative. Malva tea is not as bitter as sage tea is. I dab her gums with malva tea and it is also added to the drinking water (1-2 tbsp. per bowl). Here you can see more of Shaolin (language: German, but with lots of pictures). Pestle the cloves. Mix the dry ingredients in a bowl. Add coconut oil, boiled malva tea and peppermint oil. Blend until you get a somewhat smooth mixture. You can store the tooth paste in a cleaned jam jar. The tooth paste keeps because the ingredients don’t spoil so easily. Coconut oil has antibacterial effects. Your teeth will also benefit from that. Cloves help against toothache. Peppermint oil is for fresh breath. Malva tea is great for the gums. Curcuma whitens the teeth (also helps to channel mercury and it’s anti-inflammatory). Siliceous earth cleans the teeth better than healing earth. However, for a very mild toothpaste only use healing earth for the recipe (without siliceous earth). Melt coconut oil by bain-marie. Remove from stove. Add cane sugar by the tablespoon until the mass has reached a kind of creamy, pasty consistency. Add white tea. Finally add the essential oil for scent. Store at room temperature. In the fridge the body scrub will harden. Coconut oil melts at about 28 °C. If it is very hot in summer the body scrub might become a little more liquid. The body scrub keeps for about two months. what about products for feminine hygiene? The topic sustainability is very important for me. Each one of us has some idea what sustainability means to him or her. What can you do to grant our children and children’s children a future on this planet? One might reduce his or her meat consumption or maybe stop eating meat altogether. This is one way of conscious dealing with resources and it saves animal lives. Another one might stop using plastics wherever it is possible. The reduction of garbage in general is a way towards sustainability. Yet, some things we are so used to it is hard to imagine living without those disposable articles and sometimes this use-and-throw things are also meaningful – e.g. a surgeon should not use the same gloves twice – but sometimes one finds him- or herself asking, how did our ancestors do it and are there no other options out there? I just turned a teenager when I asked myself for instance how women did cope in the medieval times with their monthly period. Today one can buy disposable sanitary pads and tampons at any chemist’s or supermarket. All shapes and variations are available for slight or heavy flow, with or without wings, short, long, thick, thin, with or without scent etc. From young age on we get used to those disposable products. Just as of late I realised there are other options. Maybe you remember your parents telling you about washable diapers or if you are a parent yourself you remember using those. Just as with washable diapers for babies there are washable pads for women. They are eco friendlier and cheaper in the long run, but most important they are “healthier” for you. Those substances are dangerous mostly because the skin in the genital area is especially susceptible for substances which are put on or into the body for several hours. Through the blood vessels and lymph vessels the toxins circulate throughout the body and cause damage. If you decide to use washable pads be sure to use a mild washing agent. Washable pads are easy to make youself. Sewing designs can be found throughout the internet, e.g. here. This option is not only cheap, but also very creative and individual. Apart from doing it yourself you can also buy washable pads. There are several producers for washable pads, e.g. Lunapads, GladRags, Sckoon oder New Moon Pads. Lunapads for instance is not only a eco friendly brand, it also initiated an aid project for Africa. A share of every sold product goes to the project Pads4Girls which produces washable pads for women in Africa. Girls and women are supplied with these pads and therefore they can go to school or work even when having their period. Yoga for menstruation (part 1) and (part 2) by EkhartYoga. Do you already use washable feminine hygiene products? How do you cope with it? What are your thoughts on washable feminine hygiene products in general?